Lumina Gold Hits the Longest Contin | Lumina Gold Corp.
Vancouver, British Columbia - Lumina Gold Corp. (TSXV: LUM) (OTCQX: LMGDF) (the "Company" or "Lumina") is pleased to announce additional drill results from the Cangrejos and Gran Bestia resource infill, step-out and depth extension program. These three holes (C19-104 to C19-106) represent approximately 1,400 metres of drilling. The results include two holes from the Gran Bestia Deposit and one from the Cangrejos Deposit. Hole C19-105 at Gran Bestia stepped out on the northern edge of the anomaly and remained in mineralization from its collar to termination at 626-metres depth, making it the longest continuous interval of mineralization ever cut at the Cangrejos Project. The hole ended in mineralization and leaves the Gran Bestia Deposit open to the north for expansion and further discovery. 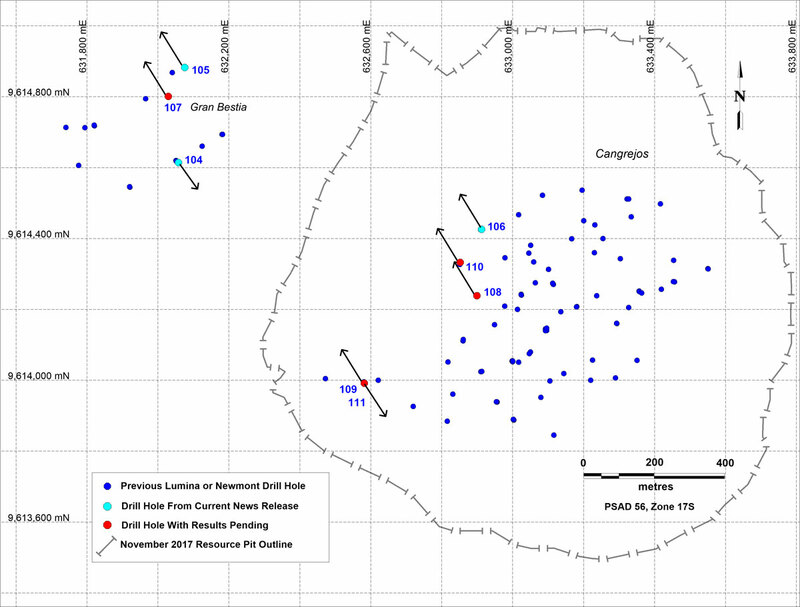 Hole C19-104 at Gran Bestia was drilled to the southeast along the southern margin of the Gran Bestia surface geochemical anomaly to determine the extent of mineralization and breccia in that direction. The hole stayed in lower-grade mineralization for 148 metres before exiting the system. 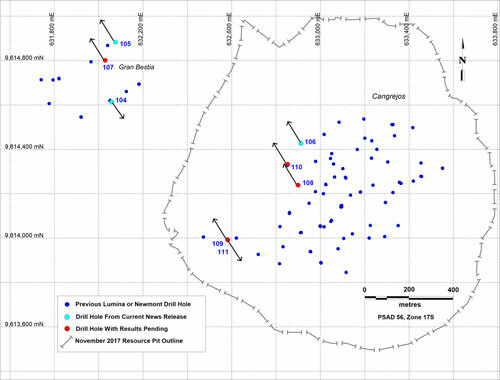 Hole C19-106 at Cangrejos was drilled to the northwest along the northern boundary of the main Cangrejos resource and cut two significant intervals of mineralization to a depth of 272 metres prior to leaving the principal deposit. Note: Intervals in the reported holes are calculated using a cut-off of 0.2 g/t Au with maximum internal dilution of ten continuous metres. Sampling is done in consistent, continuous 2-metre intervals. The highest gold value used in the reported weighted averages is 11.9 g/t Au. Above cut-off intervals of less than 10 m are not reported. In addition to the above results there were multiple intercepts of lower-grade material in the drill holes. All Lumina sample assay results have been independently monitored through a quality control / quality assurance ("QA/QC") program including the insertion of blind standards, blanks and pulp and reject duplicate samples. Logging and sampling are completed at Lumina's secure facility located at the Cangrejos Project. Drill core is sawn in half on site and half drill-core samples are securely transported to ALS Lab's sample preparation facility in Quito, Ecuador. Sample pulps are sent to Lima, Peru for analysis. Gold content is determined by fire assay of a 30 gram charge with total copper content determined by four-acid digestion with ICP finish. ALS Labs is independent from Lumina. Lumina is not aware of any drilling, sampling, recovery or other factors that could materially affect the accuracy or reliability of the data referred to herein. Leo Hathaway, P.Geo., Senior Vice President of Lumina and the Qualified Person as defined by National Instrument 43-101 Standards of Disclosure for Mineral Projects for the Cangrejos Project has reviewed, verified and approved the contents of this news release. Lumina Gold Corp. (TSXV: LUM) is a Vancouver, Canada based precious and base metals exploration and development company focused on the Cangrejos Gold-Copper Project located in El Oro Province, southwest Ecuador. Lumina has an experienced management team with a successful track record of advancing and monetizing exploration projects. Further details are available on the Company's website at https://luminagold.com/.